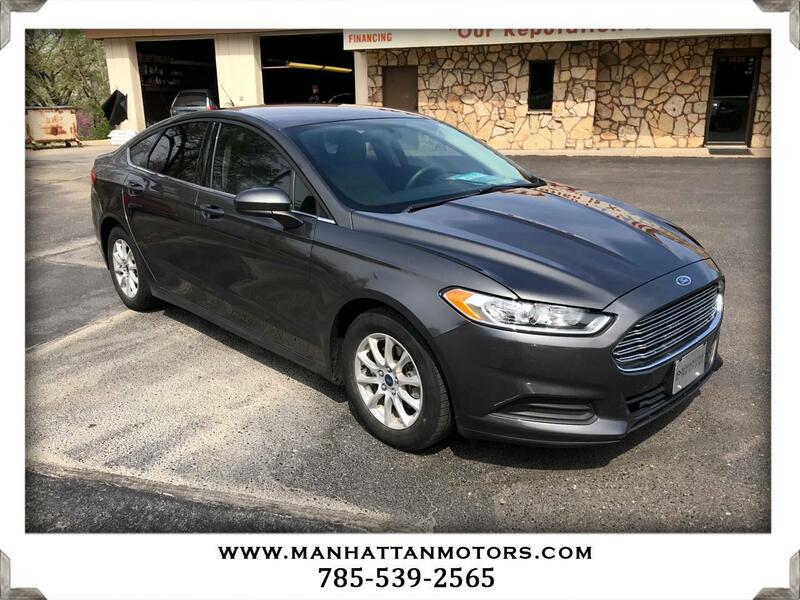 Sleek and stylish, our One Owner, Accident Free 2016 Ford Fusion S Sedan is ready to roll in Magnetic! Powered by a 2.5 Liter 4 Cylinder that offers 175hp while connected to a responsive 6 Speed Automatic transmission. This winning Front Wheel Drive combination helps you score near 34mpg on the open road and provides a composed, quiet ride that will make you want to take the long way home! Admire our photos, and you'll notice the Fusion has head-turning good looks! Climb inside our S trim and sit back in supportive seats. The voice-activated SYNC audio and cell phone interface brings you the latest in news, music and even available 911 Assist. You'll appreciate the convenience of full power accessories, keyless entry, 60/40-split-folding rear seats and a great stereo with CD, auxiliary audio jack, and USB/iPod interface. Ford is a leader in safety innovation, and with eight airbags, ABS, tire pressure monitoring and electronic stability control, you will keep the people you care about safe and secure. MyKey even allows parents to keep the young drivers of the house safe by customizing settings such as speed and audio volume. Safe, unique and steadfast... This is a smart investment! Print this page and call us Now... We Know You Will Enjoy Your Test Drive Towards Ownership! Thanks for choosing Manhattan Motors. We recently won The Manhattan Mercury Readers' Choice Award for being the #1 Used Car Dealer. Buyers enjoy our "laid back" approach. No test drive routes or high-pressure salesmen. Our focus is to offer all of the information you need to help make the best decision for your family or business. Each one of our vehicles undergoes a 30-point vehicle inspection by Burnett Automotive, Manhattan's #1 Auto Service Facility. We are also the area's only Independent USAA Certified Dealer, offering discounts on purchases and interest rates.